as far as the ARC DE TRIOMPHE. And yet, on Wednesday evening, those who answered the call of the UNEF found themselves inflicted with another traditional meeting. Loudspeakers for the “officials”, jawboning that opened up no perspectives, and to end with, a long walk that finished without explanations with a call for dispersion m spite of the obvious discontent of most of the demonstrators and at the risk of breaking up the movement. During all this time the press, with shadings and varied tactics, misrepresented the facts, lied about the movements objectives and, as in BERLIN and in ROME . . . tried to pit workers against students. 1)	Liberation of university premises and surrounding areas. 2)	Liberation of all our comrades still in prison, and annulment of penalties. 3)	Annulment of faculty lockouts. 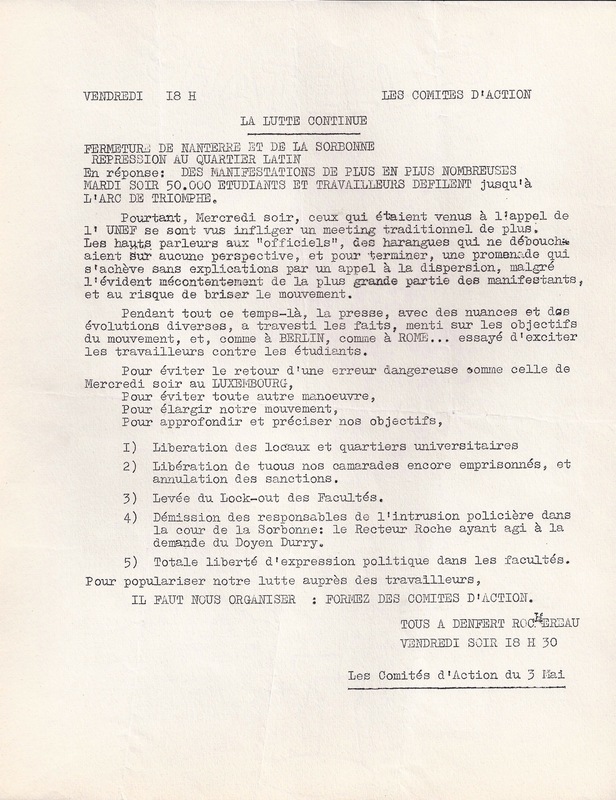 4)	Resignation of those responsible for police intrusion into the Sorbonne courtyard: Rector Roche having acted upon the request of Dean Durry. 5) Complete freedom of political expression in the faculties.